As the tagline on the teaser poster says, "New decade. New rules." and recently director Wes Craven sat down with Entertainment Weekly to talk about the 10 year absence of Scream not to mention the return of Ghostface. Craven first addressed the notion of returning to the series after such a long absence. "I can’t think of another film that has not only a true trilogy, where you’re following a single central character over three pictures, but has the complexity to the story and other characters that also have continued along. And then 10 years later, to come back to those same characters and same actors, and continue that story in a way that’s totally organic. It’s kind of unprecedented." Obviously Craven loves his creation and is forgetting quite a few trilogies that have done exactly what he says Scream does exclusively, but I can forgive him, he's just trying to bolster excitement around the next film. 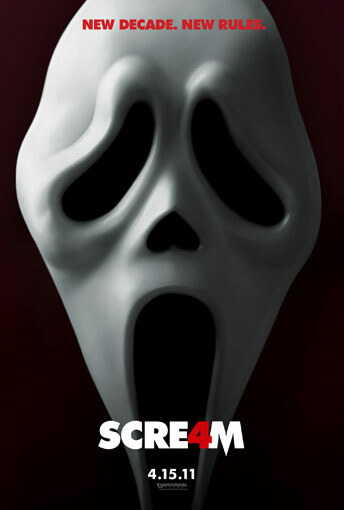 Getting to some of the specifics about "Scream 4," the horror will begin shooting in June and as the poster indicates will release on April 15th, 2011. Giving the production team less than a year to get a final product completed. Craven also explains that Sid (Nev Campbell), Gale (Courtney Cox) and Dewey (David Arquette) will remain as central figures while writer Kevin Williamson has weaved in a few new characters. Wes Craven also tells us that during the 10 year absence, Sid has enjoyed some acclaim from a novel she's penned, not to mention, a Ghostface free decade. The 4th film will also return to the series' fictional town of Woodsboro, even though production will be shooting in a new location. One other thing, "Scream 4" will most definitely be rated R.
Everything I've summarized about "Scream 4" so far is pretty run of the mill. Nothing all that exciting, but what Craven says about what's changed in the last 10 years without Ghostface, is what gets the Scream fan in me jumping for joy. Craven explains that horror movies over the last decade have changed and thus so has Ghostface. "In order to figure out what’s happening around them, the characters have to figure out where the genre of horror is. So this is a look at horror after 10 years of a lot of sequels rather than original films coming up year after year." Craven even went as far as to quote the tagline in the new poster. He said, "“New decade, new rules” is very much the keynote of the film, that is, trying to figure out what sort of rules (the new Ghostface) is following. How do we fight this killer without a road map?" Craven also says that all the remakes and endless sequels that have been coming out to the point of nauseam will be a part of the film. "A lot of films, directors, and studios are the butts of some of the jokes." Considering Scream is a series of sequels hearing Craven talking negative about too many sequels or remakes is fairly ironic. Craven however defends himself to that. He said, "I’ve never felt like these are sequels. This is a film about the progress of, at this point, three core characters, and how all of these events have changed their lives, and how the events in their lives have been reflected in the movies around them, which they might like or might really not like at all." Like I said earlier, all Wes Craven seems to be doing is a lot of positioning, but he hits a few notes that get me pretty excited. The funniest part to this whole interview is despite Craven making fun of endless sequels, he's confirmed if "Scream 4" does well, he's ready for parts 5 and 6.